I’m a serial dieter, and I’ve tried many, many different diets to try to rid myself of the cursed chub that I’ve had since I was a kid. I’ve done Weight Watchers, low-carb, the cabbage soup diet, low GI and calorie counting to name a few. The most successful in recent years has been the calorie counting, which I managed to keep up for a couple of years and I lost around 30 pounds. But a holiday in Rome, a holiday in Gran Canaria and then Christmas in quick succession meant I piled about 10 pounds of that back on. After Christmas I attempted to go back to the calorie counting, but the weight just wouldn’t budge. I don’t know whether my body is just used to that amount of calories now, or if I was just finding it too hard to stick to again, but I lost a couple of pounds and then put them straight back on. 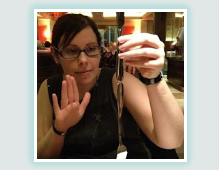 I was at a weightloss deadlock with my hated belly and hips. The thing that really spurred me on to do something was the fact that I’m going to the BAFTAs the weekend I get back from two weeks in Florida and I have had to commit to a dress. The dress I’m wearing was a bit snug, so I was panicking about the weight I’ll inevitably pile on while I’m in Florida, after two weeks of pancakes, burgers and my beloved ice cream (food of the gods). I was also feeling a bit vain about my holiday photographs. Last time I went to Florida, in 2010, I was horrified by my photographs because I looked like a hippo in all of them. It was those photos that inspired the original 30 pounds of weightloss on the calorie counting diet. I did not want another set of Hippo Goes on Holiday photos. Cue drastic action. I decided to try the fasting diet. 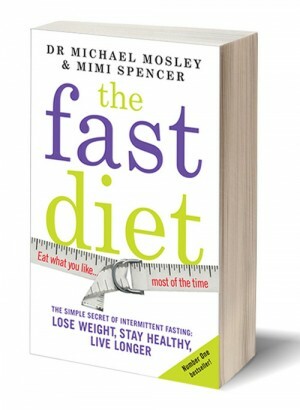 It’s an idea that came out of a BBC documentary where Dr Michael Mosley tried various methods of incorporating fasting into his daily routine. What he settled on was having two days a week where you eat just 500 calories, and the rest of the time you eat normally. What it means by ‘normally’ is your recommended daily calorie intake (2000 for a woman). You can’t expect to trough your way through 4000 calories a day and still lose weight. It supposedly has a lot of health benefits like lowering blood pressure, making you more responsive to insulin and the reduction of a hormone that causes ageing and cancer. But all I was interested in was the fact that it shakes up your metabolism and shifts weight. I was worried it would be difficult. There’s no mystery as to why I’ve always struggled with my weight, it’s because I really like my food, and I’ve been known to get grumpy, irritable and light-headed when I’ve gone without food too long, but I haven’t experienced any of those symptoms on my fast days. I haven’t really even felt that hungry. I haven’t experienced the sleeplessness that some people did when they tried this, and I haven’t been cold on my fasting days either. In fact, I’ve been warm, with a really red, rosy face! This is an odd side-effect that doesn’t seem to be common, I even emailed Dr Michael Mosley to ask him about it and he said he had no explanation! He did seem to find it quite amusing though. I’m surprised that I’ve also noticed a change in my eating habits, I’ve naturally started to eat less on my non-fasting days. I’m more in tune with when I feel full, and more likely to stop eating instead of continuing until I feel uncomfortable. It sounds stupid, but this is something that most people are guilty of doing. We’ve become accustomed to not feeling hungry, and a hunger pang strikes fear into the heart of most people. What you learn on your fast days is that hunger pangs don’t last. You feel hungry, but after ten minutes it’s gone away again. In the past, I’d have reached for a snack the second I felt that pang, but I’m learning not to. I’ve definitely been snacking less and I’ve been leaving food on my plate at the end of a meal, something that was unheard of before! I was dubious about whether it would work, but I’ve seen a steady weightloss of around a pound a week, sometimes more. In six weeks I’ve lost 6 1/4 pounds, which is more than I’ve managed to lose in such a short time since early last year. It means I can go to Florida without worrying, because even I can’t eat enough ice cream to put six pounds back on in two weeks, and it means I can get into my dress for the BAFTAs. I’m going to get straight back into it as soon as I get back and tackle the remaining blubber once and for all. The hippo is hopefully gone for good! I’m 33, but I unashamedly still refuse to grow up. I adore theme parks and rides, I love movies, and I love being able to act like I’m still a kid. So this is why I love Orlando, Florida, so much. I am going back to Orlando in 16 days, and I am so unspeakably excited that I cannot think about anything else. My Florida holiday (or ‘Floriday’ for short) which I am going on with my bestest mate, has utterly consumed both of our brains. It’s all we can talk about. It’s all I’m thinking about. I’m even dreaming about it. Almost every shopping trip I’ve had in the past month has been to get something that I’m going to take with me, from new underwear (themed for the parks – to go to Hollywood Studios I have Muppets pants and for Universal I have Spider-Man ones) to very expensive new sunglasses. I have bought so many Floriday clothes that I don’t think I will be able to take them all. I really don’t know why I’m this excited, since it’s our fourth visit. Yes, there are a few new things we haven’t done yet, and there are a few things we haven’t done since 2006 which we’re going to revist – but the rest of it is largely the same. I’ve never understood those people who go on holiday to the same resort every year, and keep going back to all the same places they’ve visted before, but perhaps I am turning into one of them. But, then, there is nowhere else on earth that’s quite like Orlando. Where else could we plan, on our lovingly illustrated and very packed itinerary, to go to eight theme parks and three water parks during our two week holiday? Where else could we go to play crazy golf and feed baby alligators, then swim with manatees? A Floriday is exhausting. Our itinerary is so packed that we only have two free days where we’re not doing anything. On two days we’re doubling up on theme parks, and on a theme park day you can expect to walk about a half-marathon. But it’s FUN, and that is just so refreshing for a big kid like me. 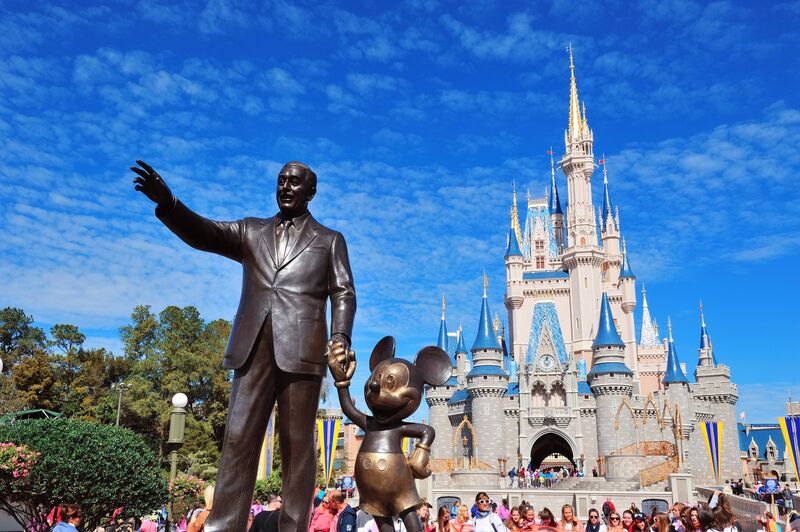 The first time I visited The Magic Kingdom I expected to find it cheesy and childish. It’s mostly for little kids and there aren’t many of the big thrill rides that I enjoy at the other theme parks. But when I walked into the park and saw that castle, I was completely won over. I felt like I was 6 years old again. When they talk about ‘Disney magic’ it sounds dreadfully corny and hackneyed, but there really is a bit of magic in that park. I never went to Florida as a kid, I was 26 the first time I went. But it was great, I got to do whatever I wanted. I could ride the same rollercoaster three times in a row without a grown-up telling me to steady down. I could demand to be driven to Baskin Robbins for breakfast. I could eat jelly beans and candyfloss for my tea while I watched the parade and cried at the fireworks. I could forget about all my responsibilities, like work and mortgages and all that adult crap, and pretend I was a kid again. Only as an adult, I think I appreciate it so much more. I absolutely cannot wait to experience that feeling again. 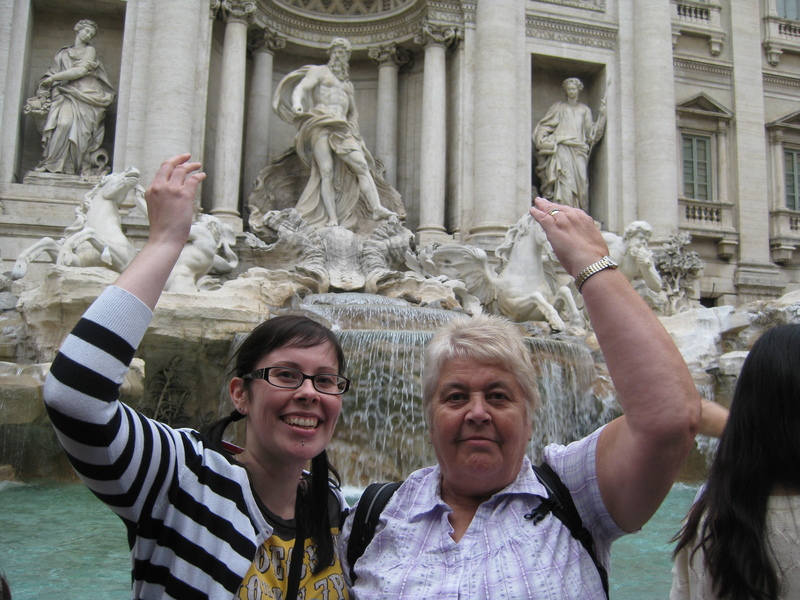 I went to Rome for a long weekend with my mum, or Mummy Pin, as I like to call her. 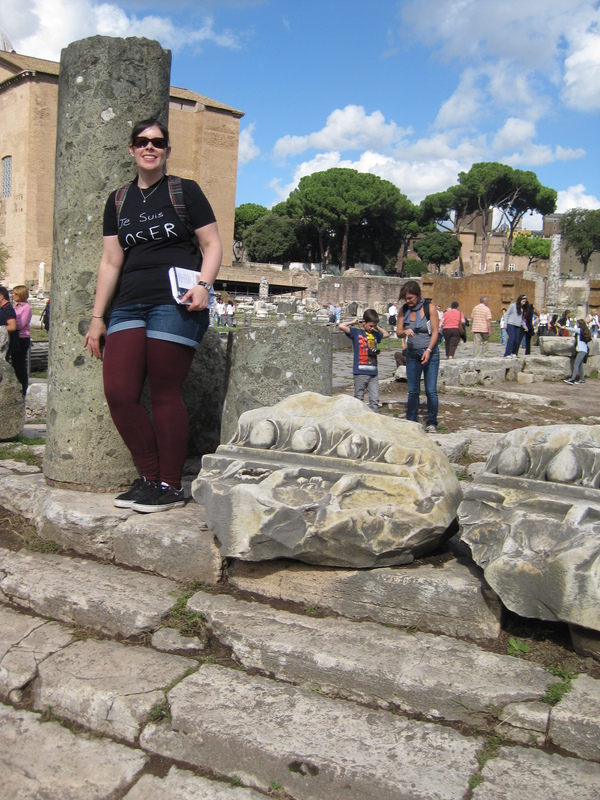 We arrived at lunchtime on the Thursday and enjoyed an exhilarating ride through Roman traffic, with our minbus driver, who was so skilled at driving that he didn’t appear to need to put his hands on the wheel. We would soon learn the knack of getting around as a pedestrian in Rome, but from our lofty seat in the front of our minibus, venturing out without a lot of metal wrapped around us looked like a terrifying prospect. Our hotel was a gorgeous old building which used to be a library, halfway between the Pantheon and the Trevi Fountain. Having been up since about 3am, both of us decided the most we could manage that afternoon was being driven around on one of those open top bus tours. After that we did manage to stumble along to the Trevi Fountain and throw in a coin over our shoulders, which means we will someday return to Rome. 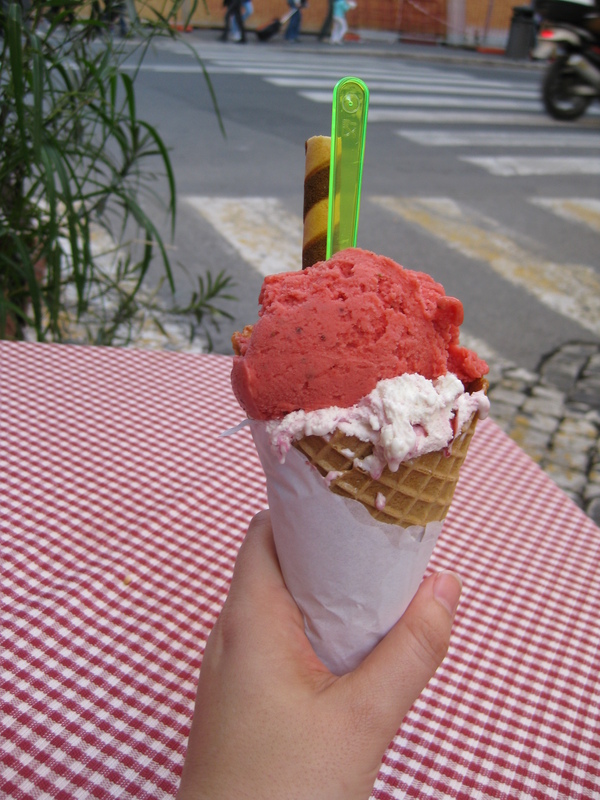 I also had the energy to buy my first ice cream. Psst! We are not really throwing in a coin in this photo. We’d already done that. Here we are skillfully pretending. 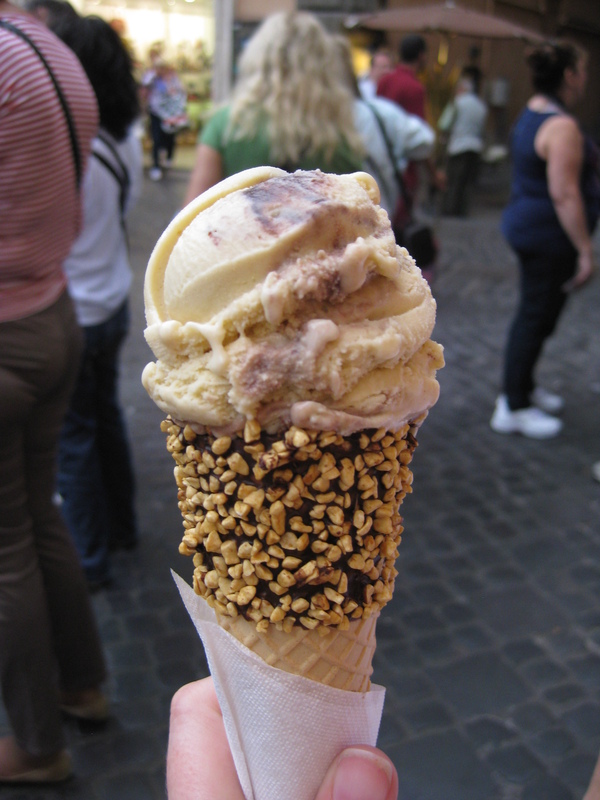 Tiramisu flavour. Oh heck, yes. The next day, I woke up to find my hotel bed had attempted in the night to swallow me. Every morning I woke up with my bum stuck between the two mattresses on my bed. I swear if we’d stayed any longer I would have eventually disappeared inside the bed, never to be seen again. It was like some sort of low-budget Doctor Who monster. After we’d eaten our tiny bowls of cereal and tiny pastries and drank orange juice from thimbles in the hotel (seriously though, why do they give you such tiny cups and bowls in hotels? All that happens is you have to fill them more than once. Just give me a regular-sized bowl and a normally proportioned pastry. I am an adult, I am adept at handling a fully grown pain-au-chocolat. 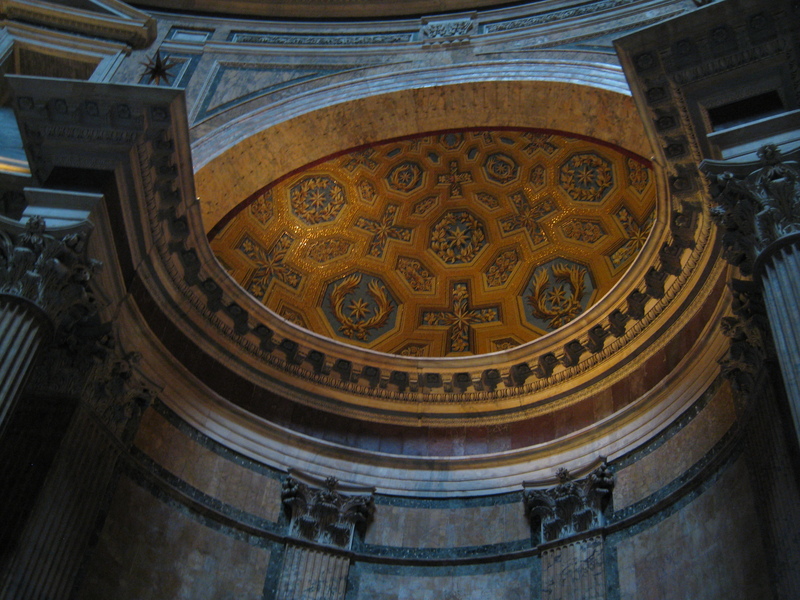 ), we headed out to the Vatican. We had a guided tour of the Vatican museums, mostly because we couldn’t be bothered to stand in a queue for two hours to get in. But our guide, Mattei, was well worth the money. 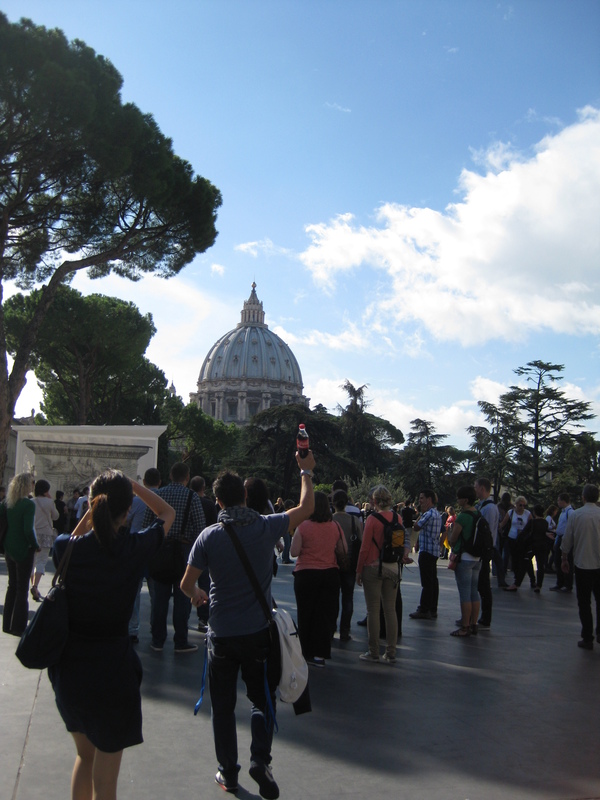 Unlike all the other tour guides, who wave an umbrella so you can see them, Mattei holds aloft a bottle of Coke. He was extremely easy to spot in a crowd. Inside the Vatican, following Mattei and his Holy Coke. The Vatican Museums are incredible, the treasures they have in there are just awesome. 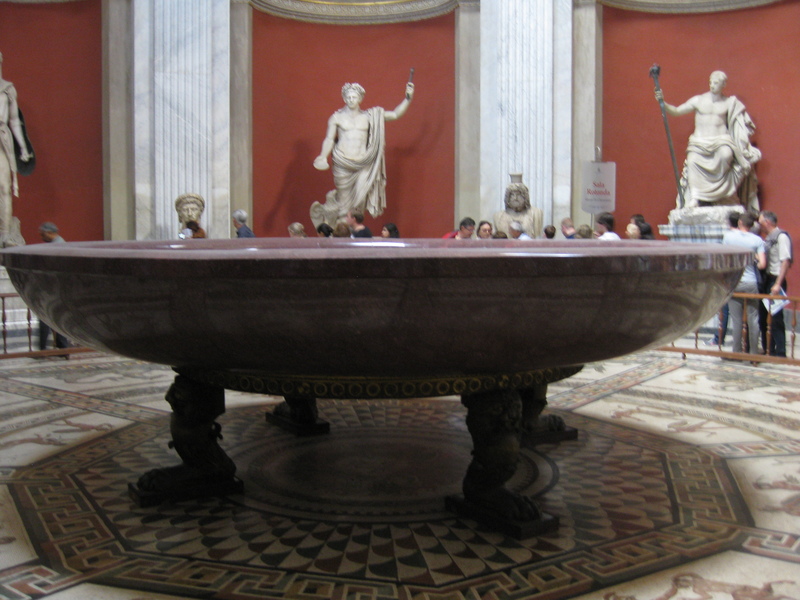 By far my favourite was Nero’s marble bath, with space for him and his 11 concubines. That would surely take a whole bottle of Matey to fill it with bubbles. The last port of call in the museum was the Sistine Chapel. I’m probably going to sound dreadfully uncultured, but it didn’t really meet my expectations. When I was in Egypt, I went to see Tutankahmun’s death mask and I was utterly spellbound. It was breathtaking, and it made the hairs on the back of my neck stand up. From the way people speak about the Sistine Chapel, I had expected the same sort of reaction, but I didn’t experience anything close. Yes, I can see the skill of the paintings, but it just didn’t have that wow factor. Maybe it’s because I don’t believe in god, maybe it’s because I know nothing about art, I don’t know, but I was a little underwhelmed. After the museum we headed into St Peter’s. It’s a beautiful church, but my photos were very dark, so I won’t bother to upload any. 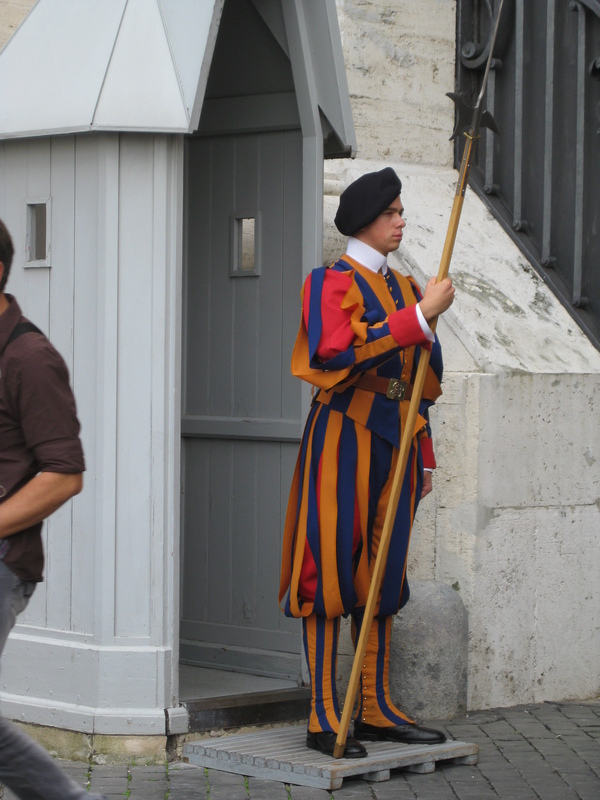 We spotted some of the Swiss Guard outside, though, which I was very excited about. One of them had a spear. Those pyjamas slightly undermine that big spear. There was a sign pointing to a museum of religious articles in St Peter’s Square. I asked Mummy Pin if she wanted to go in and she said no, pointed at some nuns and said “I can see some religious articles from here.” I’m amazed we didn’t get thrown out. On our way home, a very large lady from Gabon had a hat malfunction. It was blown off her head and right smack bang into my face, and she didn’t even notice it wasn’t on her head any more. I know she was from Gabon because it said so all over her T-shirt. Her hat had a little plastic Gabon flag on it, and it went up my nose. We walked all the way home from the Vatican to our hotel, which was a long way. I was in need of a dip in Nero’s bathtub by that point. On the way, we found a newsagent kiosk selling a 2013 calendar featuring handsome (well, some, not all of them) Roman Catholic priests. I can’t begin to describe the laughter that this elicited from me and Mummy Pin. It was just so Father Ted, we even invented a whole storyline where Ted desperately wants to be in the calendar, only to be thwarted by Bishop Brennan, the punchline being that Dougal inadvertantly ends up as one of the stars. 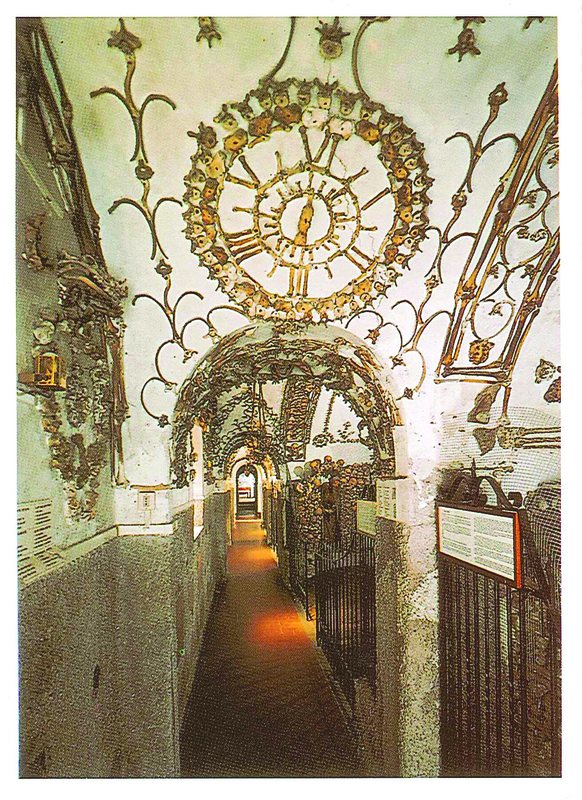 On Saturday our first stop was at a Capuchin crypt beneath a church. 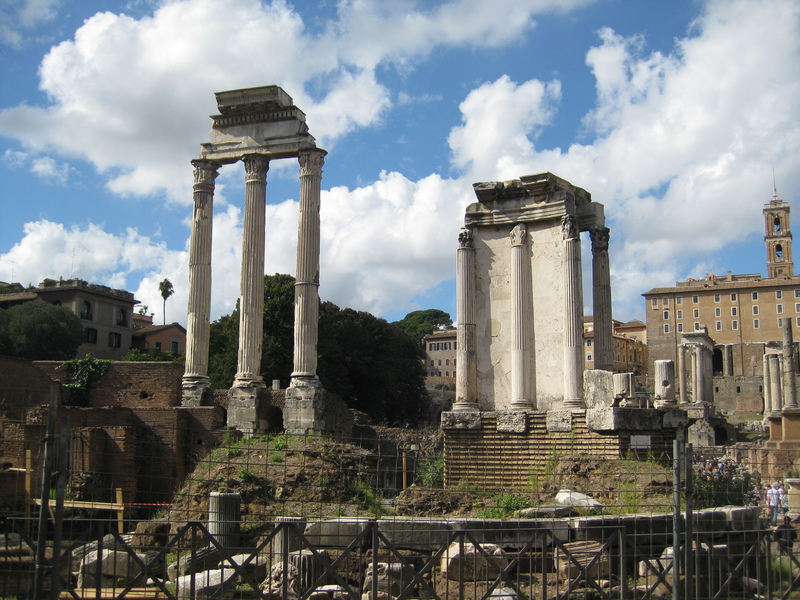 If you ever go to Rome, this is one of my top must-sees. 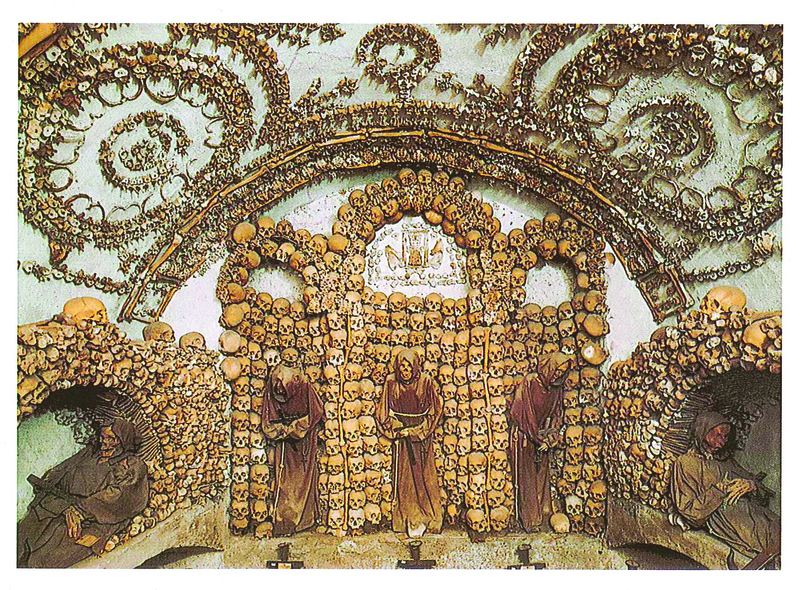 It’s an absolutely incredible place – a crypt made from the bones of 4000 monks. We weren’t allowed to take photos, so I bought some postcards and scanned them in. We visited the Spanish Steps. I don’t really get why they’re a tourist attraction, they’re just steps. Sorry, I might be missing the point and being uncultured again. Then we walked down Via Condotti and laughed at the prices of the designer clothes in all the shops. £1000 for some knitted legings? You can keep your knitted leggings, Mr Armani. 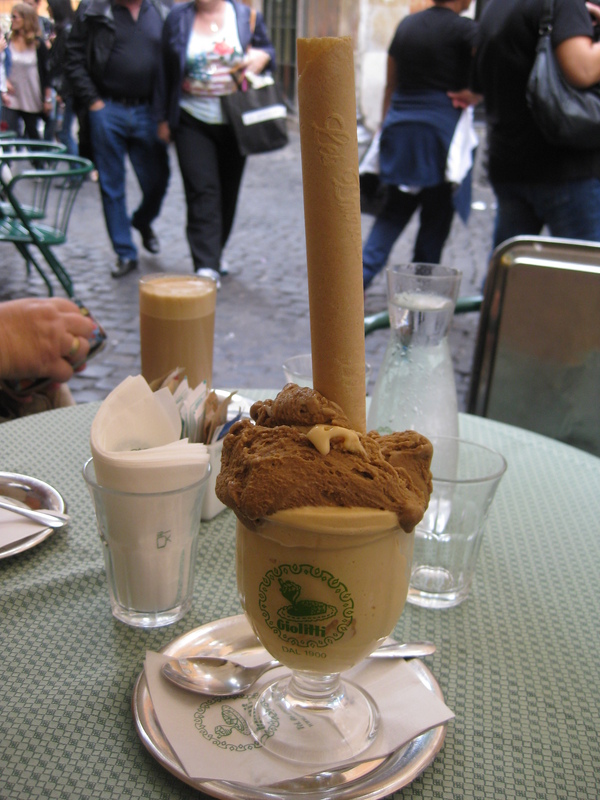 We stopped off at a famous ice cream parlour, Giolitti’s for an ice cream. I went for coffee and caramel. They didn’t have a bigger wafer. The heavens opened at this point, so we had lunch and then ducked into a museum for an hour. It was still raining on a biblical scale when we came out, so we went to the Pantheon and then went home. 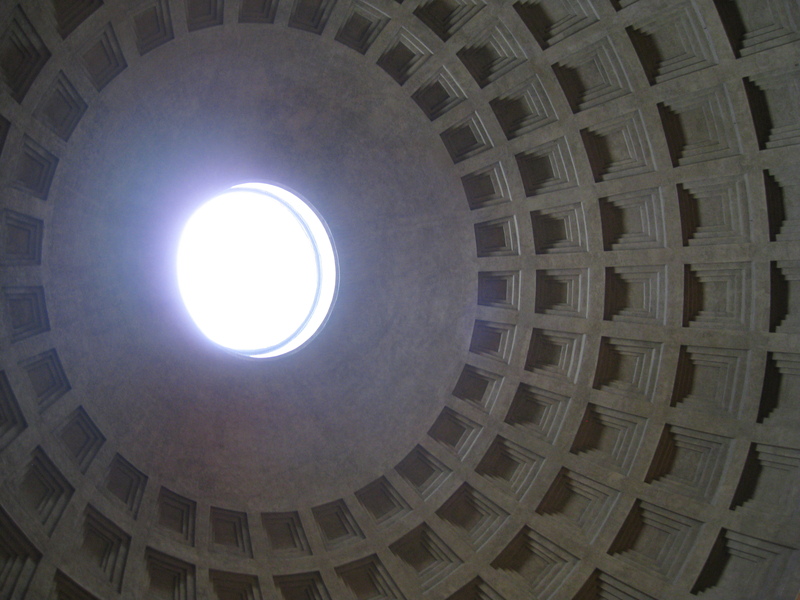 The Pantheon is very cool. The building is just beautiful, and the ceiling is wonderful. This had more of a wow factor than the Sistine Chapel for me. 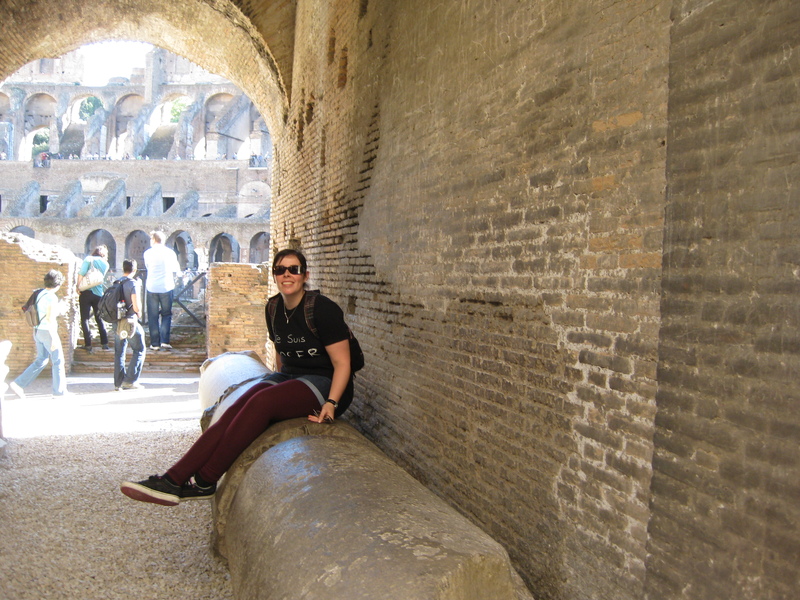 Sunday was my favourite day in Rome. 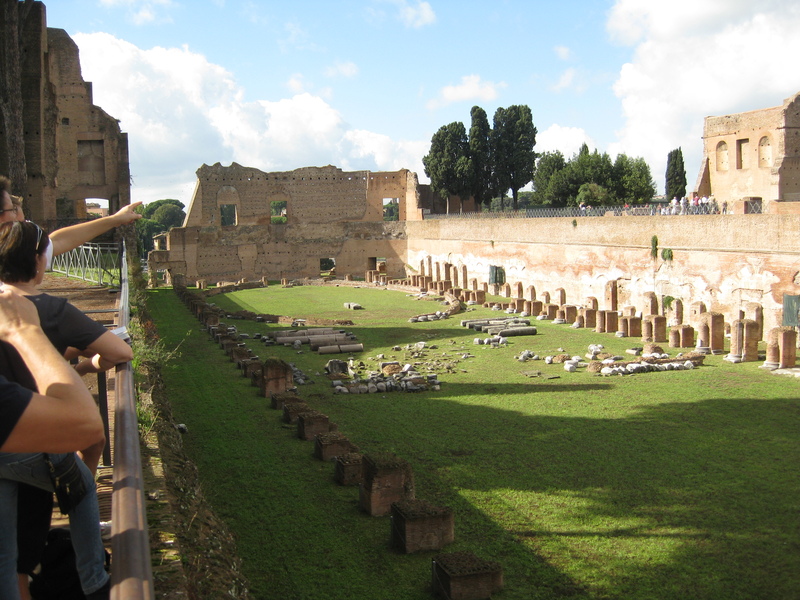 The weather was beautiful, and we did The Palatine, The Roman Forum and the Colosseum. I just loved looking around all the ruins. It boggles my mind that there are still statues standing and columns remaining from 2000 or 3000 years ago. 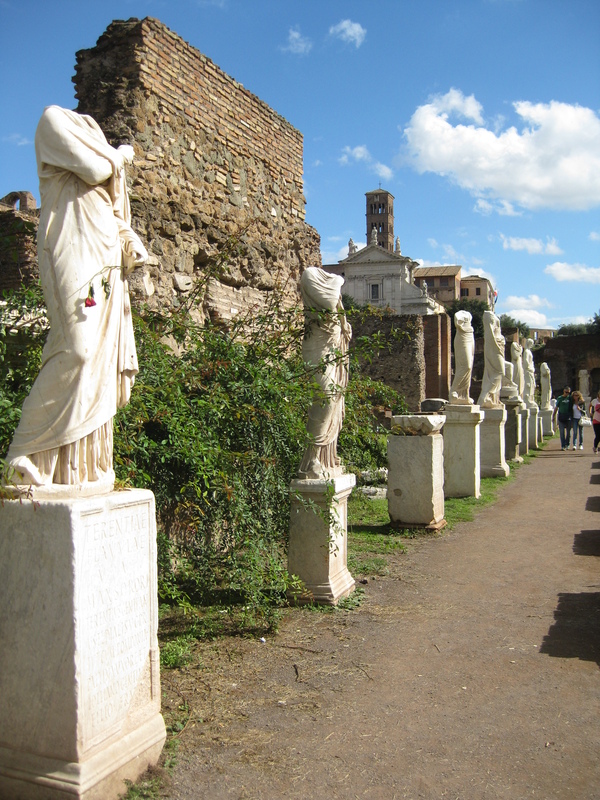 I love to think of all the people who have walked down the same paths and around the same buildings, I got quite excited imagining Julius Caesar and Brutus wafting around in their robes, especially if Brutus was as pretty as he was in the HBO series, Rome. 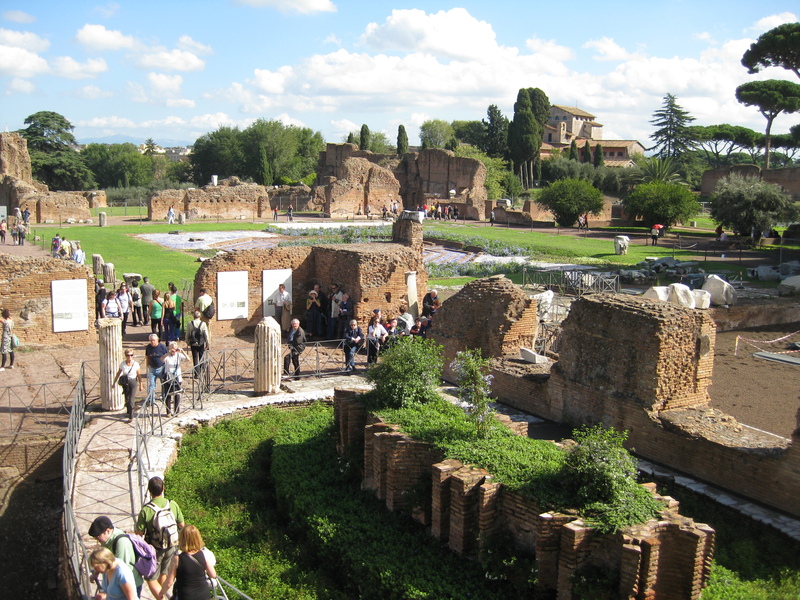 I almost fell over in the Forum, the paths are very uneven. I made a very loud noise, but remained upright. I can’t imagine the paths would be easy to navigate in sandals and a robe. I took about a gazillion photos, but I’ll save your browsers and just upload a few of my favourites. The Colosseum is just amazing. 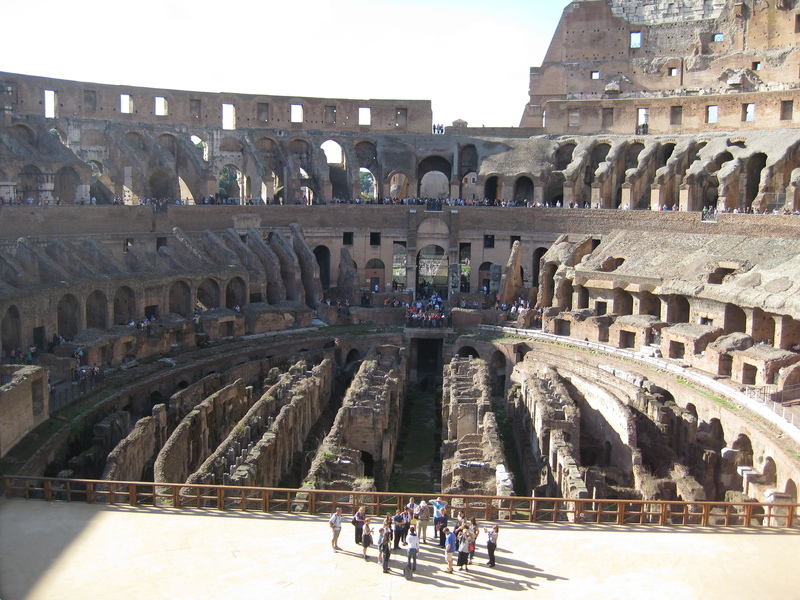 I was trying to imagine it full of Romans, all laughing and shouting and cheering on their favourite gladiators. Mummy Pin said it would be a bit like going to the match on a Saturday. I suppose it would be, and football is almost as barbaric as gladiatorial conflict, so I guess that’s a pretty accurate comparison. 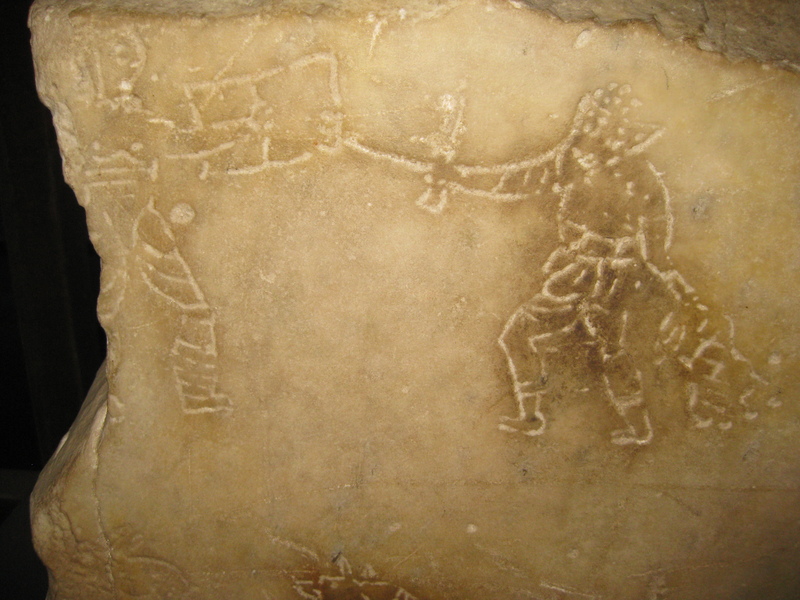 One of my favourite things was this grafitti of one ancient Roman’s favourite gladiator. You can see the area which would have been underneath the floor, where all the animals were kept. I’m glad there is no photo on me getting up on to that column, because it was very undignified. 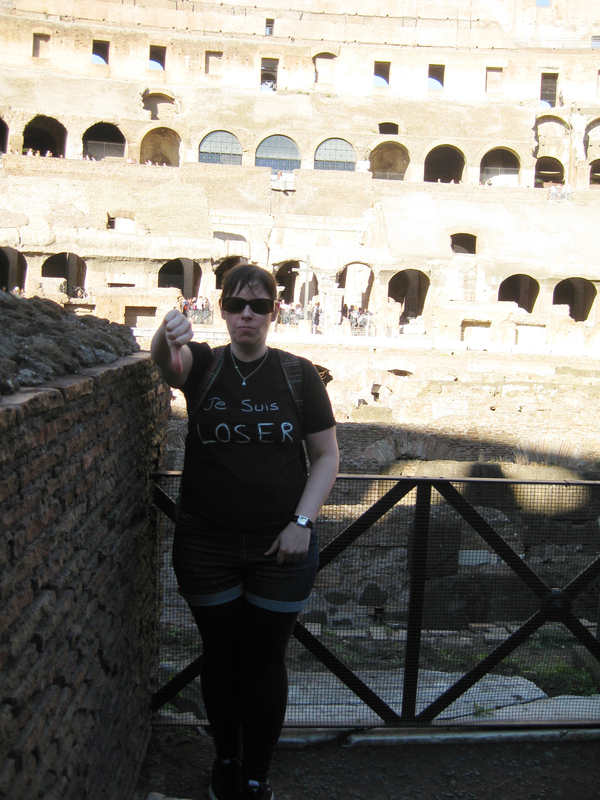 We managed to get lost in the Colosseum. It’s round, so it’s extremely easy to get lost in there. At one point I thought we were going to end up spending the rest of our holiday doing laps, looking for an exit. Mummy Pin helpfully pointed out that there was a sign pointing to the right that said there was an exit. “Of course the exit is to the right!” I said. “The exit will be right at some point, and it will also be left at some point, the building is ROUND.” Anyway, after we walked around a while longer and posed for more photos, I made up a song about being trapped in the Colosseum, and then we eventually located the exit. It was to the right. But also to the left. 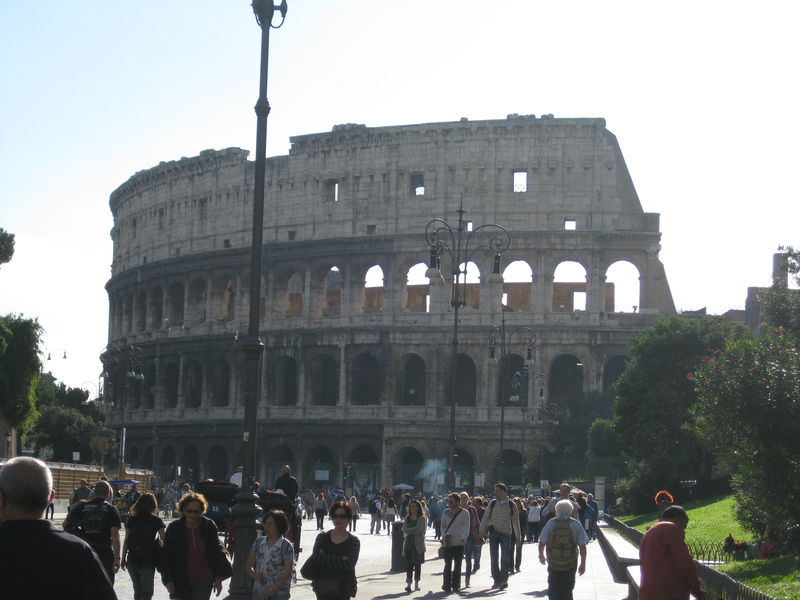 Having finally got out of the Colosseum, we trudged off home to pack our suitcases. We did a lot of trudging in Rome. I have honestly never walked so much on any holiday. Every night when we got back to the hotel, I was aching. I felt broken after the Vatican Museums! I’m so glad my hotel room had a bath because without a very hot, deep bath every night, I think my legs would actually have failed by Sunday. We had time for one last ice cream before we headed back to the hotel to pack. 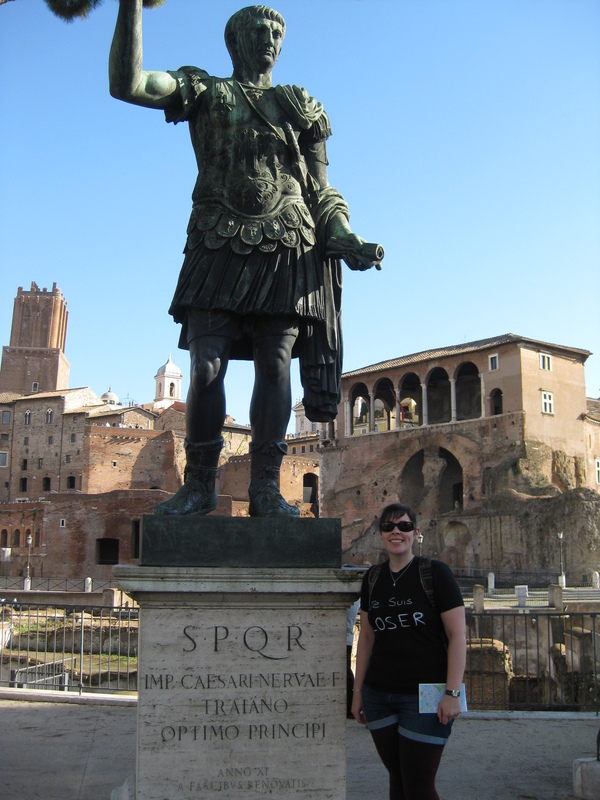 I adored Rome. I loved the monuments, the food, the hustle and bustle. I even came to love the scary traffic. A tip: to cross at a road crossing in Rome, you just have to walk. Grab a fellow pedestrian if possible, and preferably put them between the traffic and you, then just walk into the road, otherwise you will still be there three hours later. It’s actually quite exciting after a while.